Watery eyes are a common ophthalmic complaint, often causing considerable embarrassment and annoyance to the patient. Hypersecretion can be caused by dry eye syndrome, the presence of an irritating foreign body, inflammation / infection of the eyelids or eye surface, in-growing eyelashes or alteration to the normal position of the eyelids. In dry eye syndrome reflex tear secretion and watering occurs when the tear film composition is altered and the tears do not coat the surface of the eye properly. An obstruction anywhere along the tear drainage pathway may result in symptoms of watery eyes. The anatomy of the lacrimal drainage pathway is shown above. Watery eyes may occur due to eyelid deformities, age-related narrowing of the punctum or nasolacrimal duct or following infection or injury involving the lacrimal drainage system. In children it is commonly due to incomplete development of the nasolacrimal duct. Eliminate irritants, treat allergy, infection and other causes of inflammation of eyelids and ocular surface. Malposition of the eyelid from any cause should be corrected to maintain the proper position of the lacrimal puncti and to keep irritating lashes away from the surface of the eye. Epiphora due to a blockage within the lacrimal drainage system usually requires surgical treatment. Once the site of the obstruction has been established, the Ophthalmologist will discuss treatment options with you. Massage may help infants with an incompletely-developed lacrimal system. The symptoms often improve as the child grows older. Probing the nasolacrimal duct under general anaesthetic. This may be required if the duct remains blocked after the child’s first birthday. The success-rate of this procedure is highest in infants under two years. If the tear duct opening on the eyelid margin (punctum) is narrow, a minor, painless procedure can be done under local anaesthesia. Widening the punctal opening allows the tears to drain with ease. If there is a blockage within the nasolacrimal duct or lacrimal sac, an operation to bypass the blockage may be recommended. This surgical procedure (called a dacryocystorhinostomy), bypasses the blockage by creating a new drainage pathway for tears from the lacrimal sac into the nose. The operation can be done through a small incision either on the side of the nose (external DCR) or within the nose (endonasal DCR) using an endoscope and special instruments. Temporary silicone tubes remain within the nose to hold the bypass site in position while healing occurs around it and are removed about a month after surgery. Usually the operation is performed under local anaesthetic with sedation and you will return home the same day. 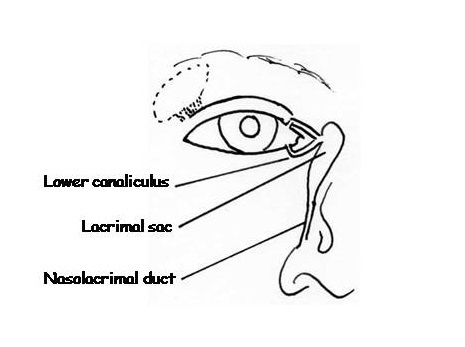 In some patients a blockage occurs within the tear canals (the canaliculi) located between the eyelid and lacrimal sac. In most cases these tiny canals are too small to be repaired surgically and your Ophthalmologist may suggest inserting a glass tube to conduct tears directly into the nose. This type of tube is not visible to the casual observer and remains in position permanently. This operation can be carried out at the same time as DCR or as a separate procedure. General anaesthesia is normally used.